An Airbus Military A330 MRTT Future Strategic Transport Aircraft (FSTA) for the RAF has completed its first contacts with a Tornado ﻿as part of a program to formally qualify the Tornado to refuel from the FSTA in operational service. 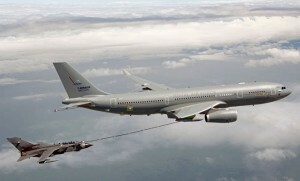 The two aircraft performed a series of dry contacts near RAF Boscombe Down over late June/early July, with the Tornado executing contacts with the A330’s underwing hose-and-drogue pods’ baskets at altitudes between 10,000ft and 30,000ft and speeds of 250-325kt. Wet contacts between both aircraft are expected to begin shortly.